When you have a passion, it is often reflected in your home. 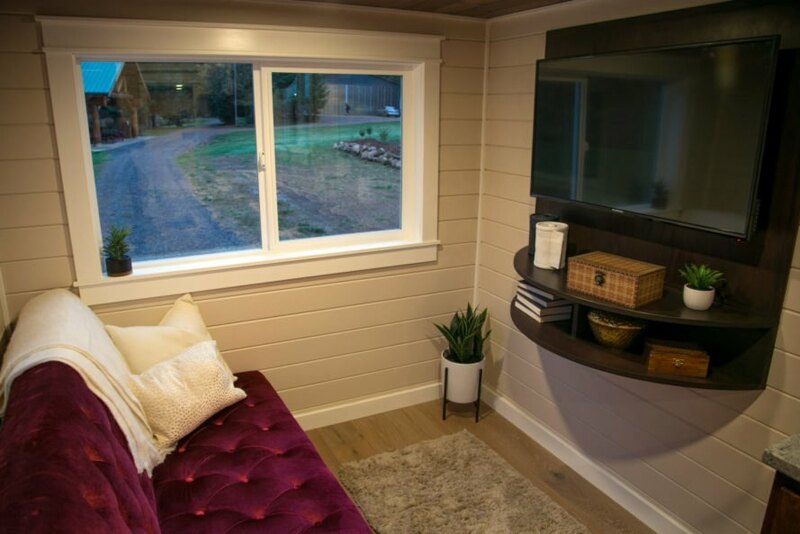 So when this San Diego family decided to join the tiny home community with a custom-built model by Portland-based Tiny Heirloom, they used their daughter’s passion for the theater as an inspiration in the design. The tiny home greets its residents with a vibrant red front door. Inside, the design feels luxe with touches of gold and deep red. Intricately hammered metal is the focal point in both the ceiling and the backsplash of the 80-square-foot kitchen. The curved dining table with a shimmering gold top is also a nod to traditional theater characteristics. Functional elements in the space include a full-size oven, stovetop and refrigerator/freezer. The entertainment area adjacent to the kitchen embodies the theatrical vibe with a tufted red velvet sofa and a large, flat-screen television. 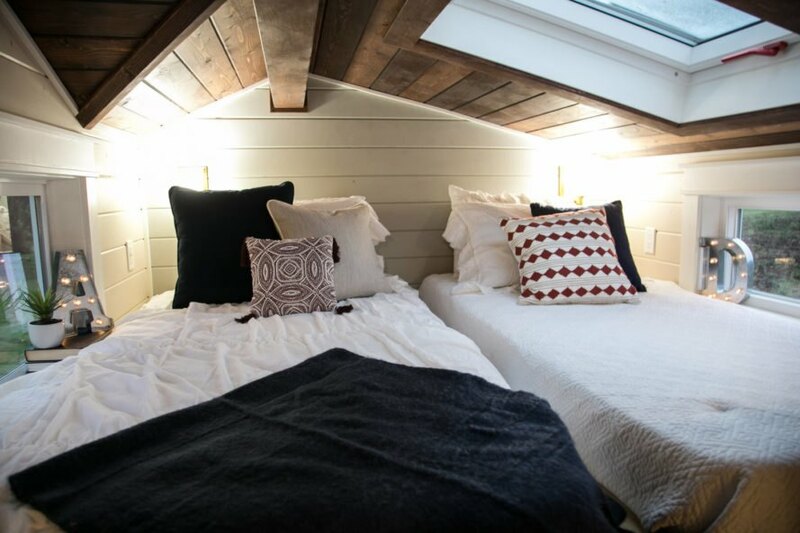 With only 200-square feet, the home boasts two separate sleeping spaces, including a master bedroom with a double bed, a skylight and two additional windows. A stairway leads to the quarters, lit with a theater-style glow to highlight the lower steps. An additional sleeping loft hosts two more beds for the kids or guests and another skylight perfect for viewing the theater of the stars at night. With a total of nine windows, the entire home benefits from plenty of natural light. Limited square footage does not limit the design elements in the detail-oriented bathroom. 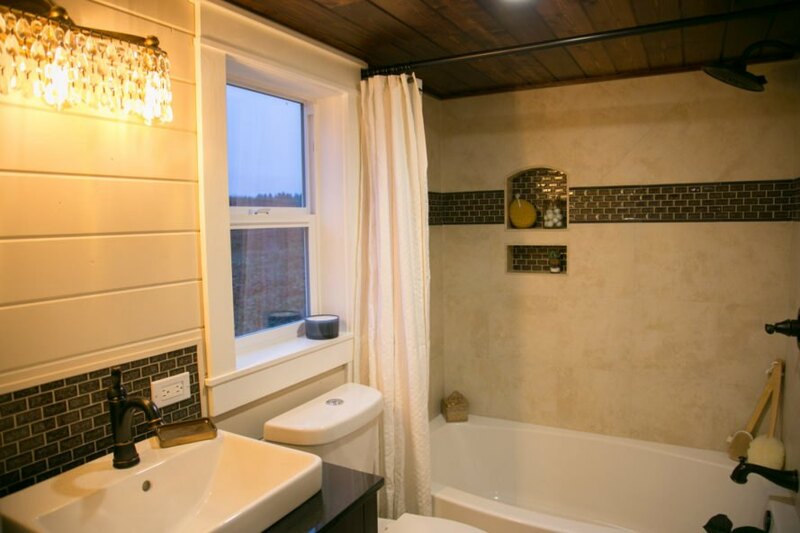 Tile inlay is the focal point in the full-size bath and shower, and a flushing toilet is a comfort not found in many tiny homes. The theater theme is not overlooked in this room either with a vintage– and chandelier-style light fixture above the large sink. Interior shiplap walls and cedar materials offer a comfortable, homey feel while built-in shelving allows ample room for storage and displays. 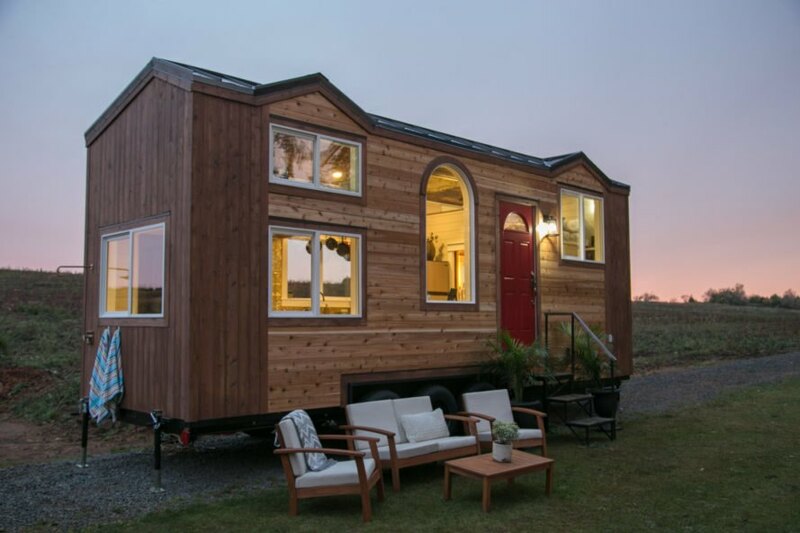 Altogether, this tiny home is certainly a show-stopper. 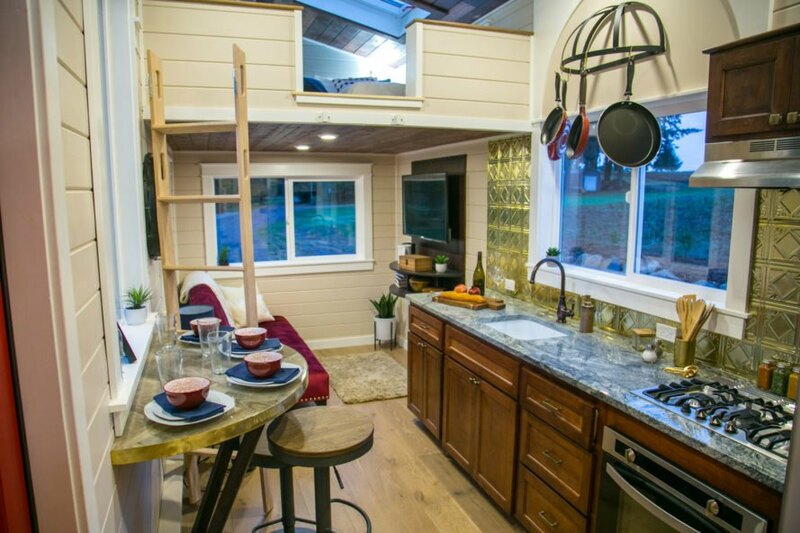 Tiny Heirloom custom-designed this luxury tiny home for a family from San Diego. The home pulls design inspiration from the theater. Luxury touches like gold and velvet add glam to the design. 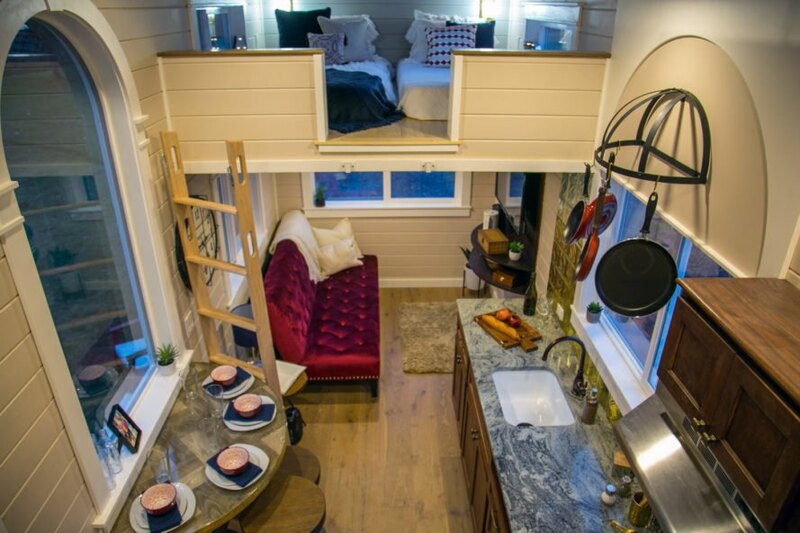 The 200-square-foot home feels spacious thanks to double lofts. A plush sofa exudes theater vibes. The living space also features a large flat-screen television. 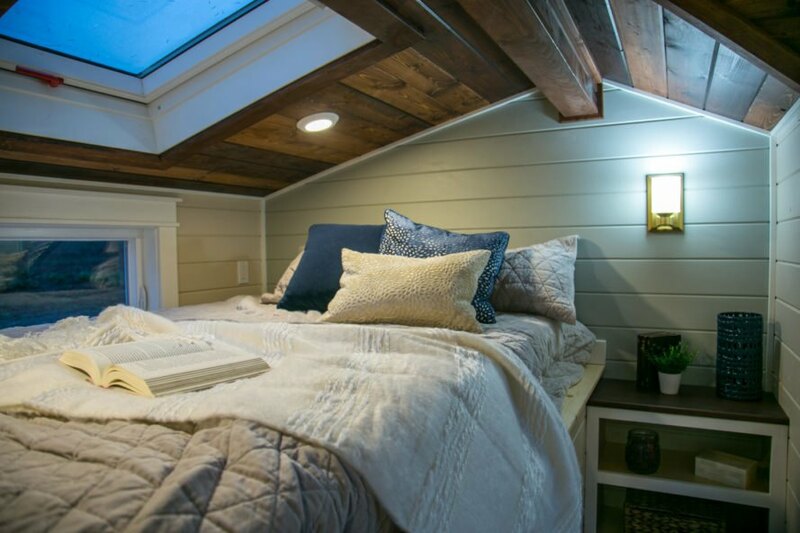 The master bedroom features skylights for additional natural light or viewing the stars at night. The bathroom also features high-end design elements. A second loft accommodates the children or family guests. The theatrical inspiration is evident throughout.